In this Photoshop Effects tutorial, we're going to learn how to create a classic "starburst" background, the same effect you've undoubtedly seen hundreds of times in grocery stores, department stores, and in those weekly flyers that flood your mailbox. Creating the effect is easy. We'll be using Photoshop's Polygon Tool, a Solid Color fill layer, the Free Transform command, and one of Photoshop's little known but very useful features, Transform Again. Along the way, we'll learn how to find the exact center of a Photoshop document using rulers and guides, and how to make objects snap to your guides! A starburst background created in Photoshop. Once we've created the background, we'll learn how to easily change the colors used in the effect, and we'll even see how to save it as a Custom Shape so you'll be able to use it again any time you want! Create a new Photoshop document. The new Photoshop document appears. By default, the rulers are turned off in Photoshop. The way you can tell whether they're on or off, besides looking in your document window, is by looking for a checkmark to the left of the word "Rulers" in the View menu. If you see a checkmark beside the word, it means the rulers are already turned on, in which case there's no need to select them here. If you do not see a checkmark, it means the rulers are currently turned off, so you'll need to click on the Rulers option to turn them on. The rulers are now visible along the top and left of the document window. Depending on how you have your rulers set up in Photoshop's Preferences, your rulers may be showing inches, pixels, centimeters, or some other form of measurement. It makes no difference which measurement type you're using for this effect. The reason we turned the rulers on was so that we can drag guides out from them, and in a moment, we're going to drag out a couple of guides, one horizontal and one vertical. Before we do that, though, we need to make sure the Snap option is enabled. With "Snap" enabled, our guides will automatically snap to the horizontal and vertical centers of the document for us. The spot where the two guides intersect is the exact center of the image! The checkmark beside the word "Snap" tells us that the option is already enabled. Make sure the "Snap To Guides" option is enabled under the "View" menu. We're ready to find the exact center of our document. As I mentioned earlier, we need to drag out two guides, one vertical and one horizontal. The "Snap" option that we enabled in Step 3 will force the guides to automatically snap into place as soon as we're close enough to the middle of the document, and the point where the two guides intersect will be the exact center. Let's drag out our first guide. We'll start with the horizontal guide. Drag a horizontal guide into the middle of the document. Photoshop will snap the guide into place once you're close enough to the middle. A vertical and horizontal guide now mark the exact center of the document. Now that we've dragged out our two guides, we no longer need to have the rulers turned on. You can leave them on if you wish, but I'm going to turn mine off by pressing the keyboard shortcut Ctrl+R (Win) / Command+R (Mac). Click on the "New Fill Or Adjustment Layer" icon. Select "Solid Color" from the top of the list. 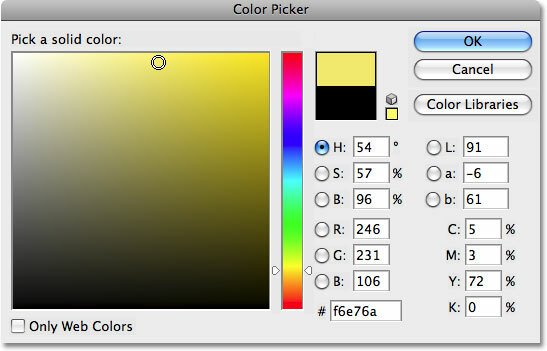 Use the Color Picker to choose a color for the background. The document is now filled with the chosen color. The Layers palette showing the Solid Color fill layer above the Background layer. Click on the Rectangle Tool in the Tools palette, then select the Polygon Tool from the fly-out menu. Change the Sides option in the Options Bar to 3. Select the Shape option in the Options Bar. We're ready to draw our triangle. With the Polygon Tool selected, the number of sides set to 3 and the Shapes option selected in the Options Bar, click somewhere in the top left of your document and drag out a triangle. Any size will do for now. It doesn't really matter where you draw your triangle either, I'm just trying to keep us both on the same page since I'm drawing mine in the top left. You want to make sure that your triangle appears to be pointing downward. By that, I mean that the top side appears perfectly horizontal. The easiest way to do that is to hold down your Shift key as you drag out the triangle. This will force the triangle to snap to specific angles. Move your mouse left or right as you drag (with the Shift key held down) until the triangle snaps into the "pointing downward" position. Drag out a triangle with the Polygon Tool. Hold "Shift" to constrain the angle of the triangle as you drag. Don't worry about the color of your triangle for now. We can change it easily later. Drag the triangle into position, with the bottom point at the exact center of the document. Step 15: Switch To "Full Screen Mode With Menu Bar"
Switch to the Full Screen Mode with Menu Bar, then zoom out a couple of times to create lots of room to work around the document. Select "Clear Guides" from the View menu to remove the guides. Drag the top of the Free Transform box up beyond the top of the canvas to stretch the triangle. The reason why we're stretching the triangle beyond the top of the canvas will become clear in a moment. Press Enter (Win) / Return (Mac) when you're done to accept the transformation and exit out of the Free Transform command. You'll notice that even though we've stretched the triangle beyond the top of the canvas, only the part that falls within the boundaries of the canvas area remains visible in the document. The rest of the triangle above the canvas is currently visible only as an outline. Press Ctrl+T (Win) / Command+T (Mac) to once again bring up the Free Transform box and handles around the triangle. I know, we just had Free Transform open a moment ago and I told you to close it, and now I'm telling you to open it again. What gives? Well, the reason is because this time, we're going to use Free Transform to rotate the triangle, and when we're done, we're going to use a little known command called Transform Again to have Photoshop repeat the rotation over and over again all around the document for us, which will create our starburst effect! If you look closely in the center of the Free Transform box, you'll see a small icon that looks like a little target symbol. This icon represents the rotation center point for the Free Transform command. Everything rotates around this icon, wherever the icon happens to be positioned. If we were to rotate the triangle with this icon in the center of the Free Transform box, the triangle would rotate around its center. That's usually what we want, but it's not what we want here. We want our triangle to rotate around the center of the document, which means we need to move the target icon into the center of the document. Drag the target icon from the center of the Free Transform box down on to the bottom center handle. With the target icon now positioned in the center of the document, we're ready to rotate the triangle. Move your mouse outside the top right corner of the Free Transform box. You'll see your mouse cursor change into a little rotation icon (a curved line with an arrow on both ends). Hold down your Shift key, which will force the triangle to rotate in increments of 15 degrees, making things much easier for us. Then, with your Shift key held down, click and drag your mouse down and to the right to rotate the triangle in a clockwise direction. You'll notice two things as you drag. One, the triangle is rotating around the center of the image, and two, it's snapping into 15 degree increments rather than rotating smoothly. Hold down Shift and rotate the triangle 45 degrees clockwise. The reason why we stretched the triangle so far beyond the top of the canvas back in Step 17 was so that it would be large enough to still extend out beyond the boundaries of the canvas even in these corner sections. Press Enter (Win) / Return (Mac) when you have your triangle rotated to accept the transformation and exit out of the Free Transform command. Now that we've used Free Transform to rotate the triangle once, we're going to let Photoshop do the rest of the work for us, repeating the rotation all around the document to create the starburst effect! A little known and therefore rarely used feature in Photoshop is Transform Again, which allows Photoshop to repeat the last transformation we made. We're going to use it to create the rest of our starburst background effect. A copy of the triangle, rotated an additional 45 degrees, appears in the document. Continue adding rotated copied of the triangle to complete the effect. The starburst shape appears on its own Shape layer in the Layers palette. The shape is visible in the layer's preview thumbnail. Notice how each of the triangles that makes up the starburst shape has an outline appearing around it? That's because the shape is currently active. To deactivate the shape and hide the outlines, simply click directly on the Shape layer's preview thumbnail (circled in red in the previous step). When a shape is active, you'll see a white highlight border around the shape layer's preview thumbnail, as you can see in the screenshot above. When you click on the preview thumbnail, the highight border disappears and the outlines will also disappear, leaving us with a much cleaner looking starburst effect. Double-click on the Shape layer's color swatch to change its color. Use the Color Picker to select a new color for the starburst effect. The same effect with a new color for the starburst shape. Double-click on the color swatch for "Color Fill 1" to change the effect's background color. Change the colors for the effect any time you want by double-clicking on the two color swatches in the Layers palette and selecting different colors. Try using two shades of the same color rather than two separate colors for a different look. As you can see, you can easily change the look of the background any time you want by selecting whichever colors work best for the project you're working on. Since we've created our starburst background effect as a shape in Photoshop, why not make things really easy on ourselves and save it as a Custom Shape! That way, we'll be able to reuse the shape any time we need it without having to redo all the steps! We'll look at how to do that next. Click on the Shape layer's preview thumbnail to active the shape. The outlines are now visible around the shape. Go to Edit > Define Custom Shape. Note: If you forgot to make the shape active first, you'll find that the Define Custom Shape option is grayed out and unavailable. You'll need to make the shape active and then try again. Enter a name for your new custom shape. Select the Custom Shape Tool. Select your custom shape in the Options Bar. Click near the center of the document and drag out the shape, holding down Shift plus the Alt (Win) / Option (Mac) key as you drag. The effect after dragging out the "Starburst" custom shape and changing its color. Go to Select > All to place a selection marquee around the entire document. Click on the Align Vertical Centers (left) and Align Horizontal Centers (right) icons in the Options Bar to center the shape. The starburst shape is now aligned with the center of the document. And there we have it! That's how to create a classic starburst background in Photoshop! Visit our Photo Effects section for more Photoshop effects tutorials!